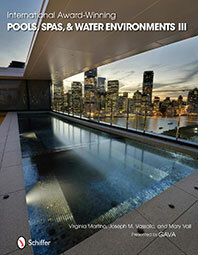 Spectacular pool design reflects inspired living. Sunset’s aim is always to provide new pool owners with an integrated contemporary living space that goes beyond merely taking advantage of its location and outlook. Their concept was realised by Sunset Pool’s ability to embrace their abstract notion then transform it into a spectacularly successful bespoke pool design that became part of this new home’s quirky architecture. Sunset’s designer pools constantly redefine the ultimate in creative leisure by responding to the inspiration and aspirations of imaginative and uncompromising individuals like you. 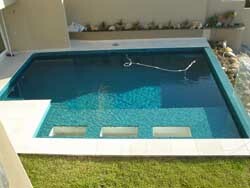 Complete the enquiry form to arrange your site inspection, or call Sunset Pools today on 1300 000 412. This Sunset pool innovation was designed to include unique features plus capitalise on both existing and created aspects of its elevated oceanfront location. The concept takes advantage of the sites many observable aspects and makes the most of the views directly out over the ocean. The pool is situated above the home’s master bedroom incorporating structural elements of this new build’s unusual architecture in its fabrication. Most specifically a row of skylights in the bedroom’s ceiling that also form glazed portals in the pool’s swim-out directly above. The skylights permit flickering natural sunlight to filter through during the day, then transform into a shimmering observation portal to the stars at night. The result achieved allows the elated owners to experience the ocean waves breaking over the rock face below their house before retiring to bed surrounded by water beneath their Sunset Pool. They can sleep comfortably beneath the stars, secure in the knowledge that their swimming pool’s form work actually comprised part of their home’s concrete construction. Exacting projects where the pool has to be constructed in conjunction with the house require forward planning and provisions for all the conceivable services to be considered in meticulous detail and be in place prior to pouring. 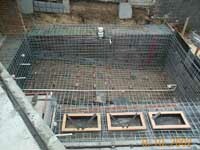 The pool’s plant room was built into the centre of the house where special vibration elimination mats were placed under the pumps. Together with water management and sanitation reticulation, special flue and ducting was installed within walls, ceilings and the reinforced steel shell to ensure the gas heater works effectively within the plant room. 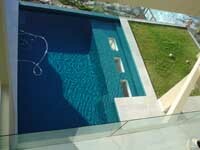 Finally the double formed and waterproofed pool shell was poured and vibrated before rendering and finishing with a Ezarri glass mosaic interior and tiled coping. Sunset are regularly engaged to work with architects and builders, combining our complementary design skills and knowledge of specialised engineering to devise distinctive pool concepts that harmonise seamlessly with flexible living and entertaining environments. The final result incorporates top of the line underwater audio and video surveillance cameras and lighting technology forming an incredible asset to a beautiful and unusual home. A Sunset designer pool epitomises the ultimate in creative leisure and can be designed to include unique features that take advantage of both existing and created aspects of your site. If you imagine that your location’s potential would be compromised by a less inspired pool design, complete the enquiry form to arrange a site inspection, or call Sunset Pools today on 1300 000 412.